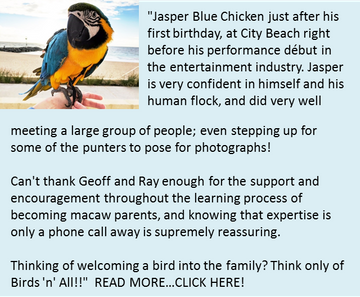 Aviculture, or the keeping and breeding of birds as a hobby, is well established and popular in Australia. Nearly all species of Australian parrots and finches can be found in aviaries. Many introduced or exotic birds are also kept by aviculturists. Many people are under the impression you can just buy a bird and put it in your backyard. Some birds require a obligatory bird license and housing arrangements such as a double door setup to the aviary. These licenses are applicable to Western Australia, if you are interstate, you will need to inquire at your local licensing authority. What license do I require for my birds? What license is required, if at all, depends on the species and, in some cases, the numbers held. Some species are exempt from licensing. The aviculture application forms are listed below. Birds that are common both in the wild (native species) and in aviculture. They are easy to keep and breed. Relatively common and easy to keep birds. The license fee is $10 per annum. Birds that are the subject of illegal activities, are difficult to keep and breed and/or are uncommon or threatened in the wild. This licence also covers birds under the Avicultural License. The license fee is $20 per annum. Birds (mainly exotic) declared under the Agriculture and Related Resources Protection Act. These are known to, or have the potential to, be agricultural pests. These permits are either free or $30 per annum, depending on the species held. Some birds will require both an (Advanced) Avicultural License and a Declared Bird Permit. If you wish to apply for or renew a license/permit, please indicate on the application form the species and numbers of birds actually held. Include only birds currently held. Do not list intended acquisitions. Where Can I Obtain Information? The Wildlife Licensing Section of DPAW is the "one-stop" licensing centre for all your avicultural licensing requirements. You are welcome to download and print the documents below and bring to Birds n All with you if you wish to purchase a bird(s) found on the Declared Birds List. Please click on the appropriate document(s) you require below.